Useful, attractive, accurate and thoughtful software for engineers and contractors. We always have our smartphones with us. We need to quickly and accurately create great HVAC designs for our clients and customers. Improve your design and get those old sizing wheels and charts off of your desk! With HVAC design software from Pheinex, your tools are always with you. 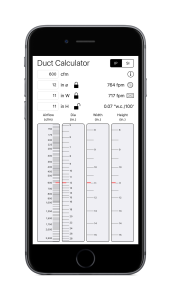 Duct Calculator – The Duct Calculator App for iPhone/iPad is a modern take on a the classic duct sizing wheel to quickly and accurately size a new duct or calculate the performance of an existing duct. 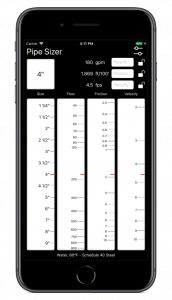 Pipe Sizer – The Pipe Sizer for your iOS device has been designed to allow quick and accurate analysis and sizing of piping systems right on your iPhone or iPad. Put away your old System Syzer and move into the present! 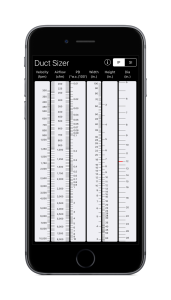 Duct Sizer – The Duct Sizer for iPhone/iPad has been designed to work in a manner similar to the traditional duct sizing wheels (such as the Trane Ductulator) that have been around for many years and that many engineers are accustomed to. Designed to allow quick determination of the duct size(s) that will meet the design goal. 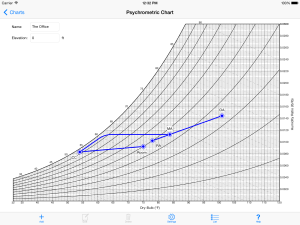 Psychrometric App – The Psychrometric App for iPad/iPhone is an interactive, graphical psychometric chart app. Allows you to create and manipulate charts and state points with the touch of your finger(s). 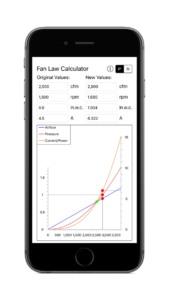 Fan Law Calculator – The Fan Law Calculator for iPhone/iPad has been designed to allow quick estimation of the performance impact of variation in airflow and/or rpm on an existing system. The standard fan law equations are used to estimate the system performance changes.